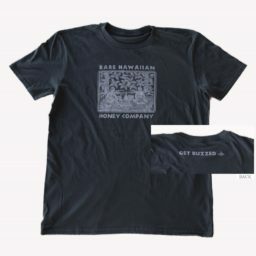 Enjoy our custom designed Hawaiian Honey graphic print t-shirts, sure to keep you cool and comfortable. Tees are 100% cotton, super soft and lightweight with a relaxed fit, scoop neck and short sleeves. Available in Ladies sizes S-XL. If you would like more information about shipping, including our Holiday shipping schedule, please visit our Shipping page. © 2019 Rare Hawaiian Honey Company.